Nepal will be eager to make a mark during the inaugural UAE tour. Both United Arab Emirates and Nepal are set to clash for the first time in an official ODI series, with the opening fixture scheduled to be played at the ICC Academy in Dubai on Friday, January 25. Though this won't be their first ever ODI face-off as both faced each other in an official One Day International; during Asia Cup Qualifier 2018, UAE comprehensively beat Nepal by 78 runs. This will be Nepal's second official ODI tour and they will be eager to make a mark on the occasion. Previously, they visited the Netherlands for a two-match ODI series. After losing the first ODI by 55 runs, they somehow managed to keep their nerves in second ODI and snatched a thrilling one-run victory to square series 1-1. Nepal's batting will mostly depend on Dipendra Singh Airee, Sompal Kami and skipper Paras Khadka. All three have been among runs in recent past. Airee was, in fact, their best batsman during their previous meeting with UAE. He scored 40 runs from 62 balls and will be eager to come out with a much better show this time. Kami and Paras, on the other hand, have breached 50-run mark against the Netherlands and it'll be essential that these two come out with similar intent against Emirates. Sandeep Lamichanne is going to be their key against UAE. The bowler from Nepal possesses a lot of experience under his belt and has been a go-to bowler in many leagues around the world. He has also taken most wickets for his national side and will be backed by skipper to get few scalps upfront. 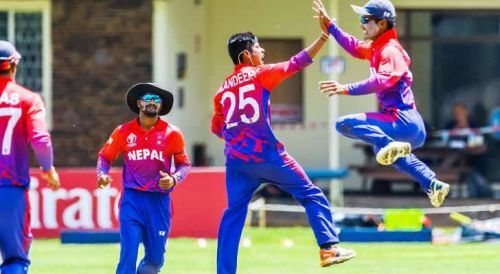 They will also bank on the likes of skipper Paras Khadka, Basanta Regmi and Sompal Kami to trouble the opponents and slow down the run rate during middle overs. Expected Playing XI: Paras Khadka (c), Aarif Sheikh, Dipendra Airee, Karan KC, Sandeep Lamichhane, Gyanendra Malla, Rohit Kumar, Basant Regmi, Pradeep Airee, Sompal Kami and Avinash Bohara. 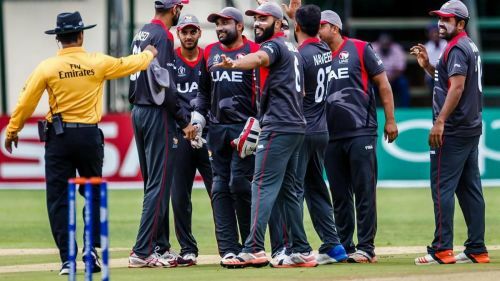 UAE aim winning start against inexperienced Nepal. UAE faced a certain huge blow ahead of the series as they will be without their regular skipper Rohan Mustafa, who has been suspended from cricket for breaching the ECB's Player's Code of Conduct. In his absence, UAE have appointed Mohammed Naveed as the stand-in captain. UAE batting will rely mainly on Shaiman Anwar, who has been their most experienced campaigner with more than 1000 ODI runs. The skipper will need him to score a big one on the occasion. Muhammad Usman and Mohammad Naveed are their next best batsmen in the lot and it will mostly depend on these two to get the team to a decent total. While they will also depend on someone like Chirag Suri, who was their top scorer with 65 runs in the previous fixture against Nepal. The opener will be expected to replicate his performance and take them off to a brisk start. When it comes to bowling, skipper Mohammad Naveed will once again bear the responsibility to lead from the front. He has taken most 45 wickets for his national side and is expected to make things difficult for Nepal's batsmen. He will, however, need Amir Hayat, who picked two wickets in the previous fixture against same opponents, to level up his performance and pick few scalps early on. Mohammad Naveed (C), Ashfaq Ahmed, Chirag Suri, Mohammad Boota, Shaiman Anwar, Ghulam Shabir, Imran Haider, Muhammad Usman, Amir Hayat, Qadeer Ahmed and Zahoor Khan.